Truck capacity has historically been viewed as a commodity. The onus has therefore been on the carrier to position itself as the customer’s “carrier of choice.” But if you haven’t noticed, that’s changing. more selective about the loads they haul. 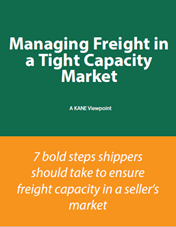 This free eBook examines 7 bold steps shippers can take to ensure freight capacity in a seller’s market.